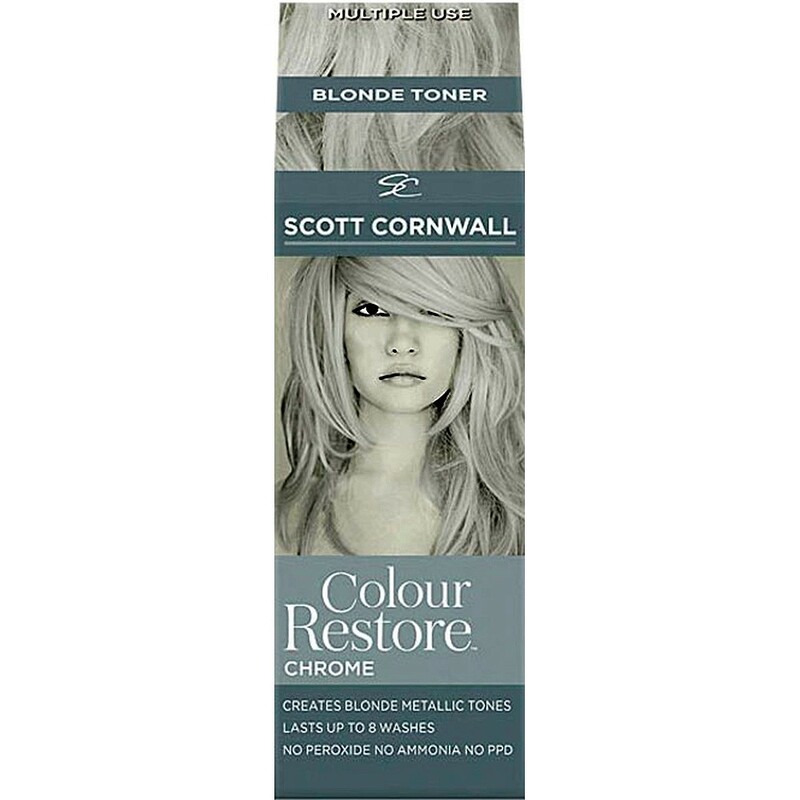 Scott Cornwall Colour Restore is a salon quality range of temporary colours, uniquely formulated to enhance fading shades, or create natural to vibrant tones, whilst conditioning the hair. Colour Restore Chrome is a pure silver toner for very light blonde, bleached, highlighted or natural grey and white hair. Use for 20 minutes to create metallic blonde tones or as a two minute regular conditioner for chrome hues. Creates Metallic tones, Lasts up to 8 washes. No peroxide. No Ammonia. No PPD's. Colour Creation - For an intense result or to create a shade, rinse hair with warm water, shampoo and lightly towel dry. Apply Colour Restore throughout, leave for 20 minutes and rinse again with warm water. Colour Restoration and Retention - After washing apply Colour Restore as a regular conditioner. Work throughout the hair, leave for two minutes and rinse with warm water. Suitable for early signs of grey hair. Not recommended for more than 20% grey coverage. Multiple use and each use lasts up to eight washes. Aqua (Water), Cetearyl Alcohol, Cetrimonium Chloride, Triethanolamine, Parfum (Fragrance), Methylchloroisothiazolinone, Methylisothiazolinone, Magnesium Chloride, Magnesium Nitrate, Basic Blue 99, Basic Red 76. Conduct a skin sensitivity test 48 hours before use. This product may stain skin if not removed. Avoid contact with eyes. If contact occurs, rinse immediately. Protect clothes and upholstery during use.